We are so glad to let you know that we have added another member to our fabulous Design Team! 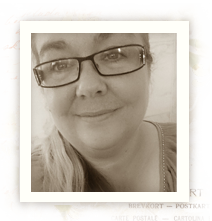 Meet Johanna Westin, a creative paper crafter who will be staying with us until the end of 2015! My name is Johanna Westin but I call myself “Pojjo” online. I live with my partner and our two children in a small village in northern Sweden. I started scrapbooking in 2008, when my doctor recommended that I’d start with a quiet hobby and told me about scrapbooking. It didn’t take long before I was hooked. When I create, the colors and patterns of the papers are incredibly important, they are the very foundation of my creations and trigger my creativity. I often choose mild and soft colors so it’s not a surprise that Pion Design’s beautiful papers have been my favorites since the very beginning. I would probably describe my style as a mix of vintage and romantic, but I’m not afraid to try new styles and things. For me scrapbooking is like a balm for the soul, making me feel good and relaxed and this hobby has also given me the opportunity to get to know so many fun and nice people. I have been a designer for several shops and businesses over the years, but I must admit it was incredibly flattering to be asked by Pion Design if I wanted to be part of their Design Team. Who can say no to something like that?! So I hope I’ll be able to inspire you here at Pion Design, and you are always welcome to visit my blog.